The decision comes nearly a year after a separate judge ruled against the project, arguing that the Googie-style, Kurt Meyer-designed bank was worth preserving. Gehry’s controversial project has faced a litany of complaints from the community since it was first announced in 2015, both from NIMBY-driven and preservation-focused groups. Initially, the project was tarred for being too tall, too dense, and for blocking views of the city from the adjacent Hollywood Hills. Next, preservation groups such as the Los Angeles Conservancy and Friends of Lytton Savings came out against the project for its proposed demolition of the historic bank. 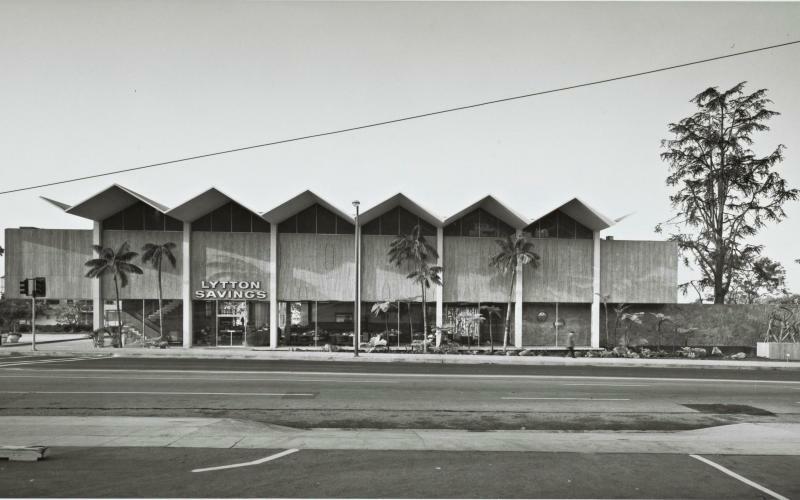 Following this initial dust-up, the 1960s-era Googie-style structure was swiftly landmarked, cited for its clean modernist aesthetic and its folded plate concrete roof. After last year’s ruling—precipitated by a suit from the L.A. Conservancy—it was hoped the bank could be saved and incorporated into the 229-unit mixed-use development. That opportunity has now disappeared. The Gehry project, as currently designed, consists of a cluster of five wobbly towers of various heights organized around a series of public outdoor spaces and ground floor retail. The development’s tallest tower is expected to rise up to 15 stories high. Hopes that 8150 Sunset would move toward final approval were dashed with the most recent ruling, however, which all but cleared the project’s forward movement. The ruling issued last week, according to the Los Angeles Times, stipulates that although the Kurt Meyer structure was not reason enough to stop the project, the project’s approval was incorrectly administered nonetheless. At issue is a proposed street vacation that would eliminate a right-turn lane bounding the project in favor of adding pedestrian sidewalk space to the project. Because the development is a private project, the judge ruled, closing off the right turn late equates with vacating a street, a measure that requires strict and separate approval. The court is sending the project back to the city so the lane closure can be properly approved.